DuPage County Board Chairman Dan Cronin is seeking his second term to oversee the second-largest county in the state. He is being challenged by Bob Peickert, head of the DuPage Democratic Party, Peickert comes to the race well-versed on the issues and sincere, but frankly, this is an easy call: Cronin has been an outstanding chairman, a strong leader who, as he puts it, "must be a leader with a vision and the ability to carry forth that vision." Most prominently, Cronin has led the charge, including getting the General Assembly to approve enabling legislation that has paved the way for reducing the amazing number of individual government units in the state. (Illinois easily leads the nation in this dubious distinction). He also has applied that principle to looking at county agencies, and after transferring duties and eliminating repetitive services, has resulted in improved efficiencies. Cronin pushed for ethics reform to apply stricter standards not just for the county but to 24 other county-appointed agencies. He's been front and center in the county's model efforts to fight the growing heroin problem. 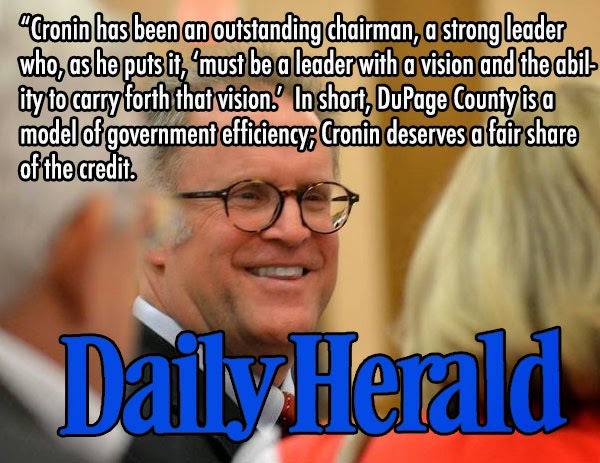 In short, DuPage County is a model of government efficiency; Cronin deserves a fair share of the credit.